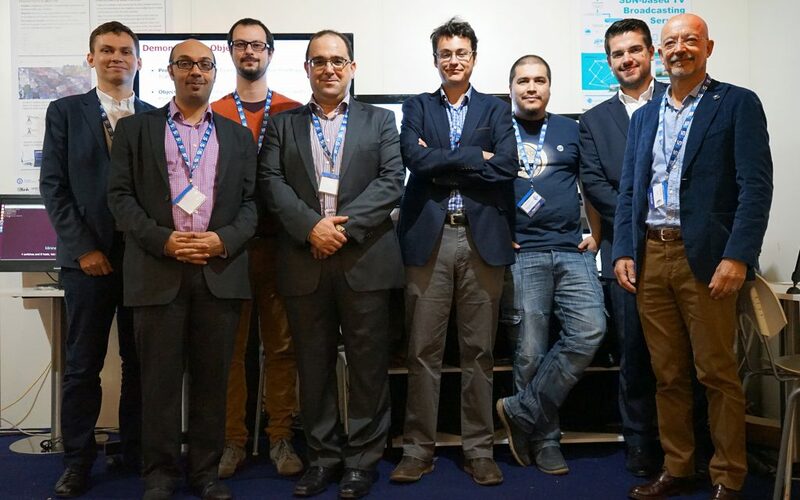 The 2nd 5G Global Event was held in Rome, Italy in November 9 and 10. 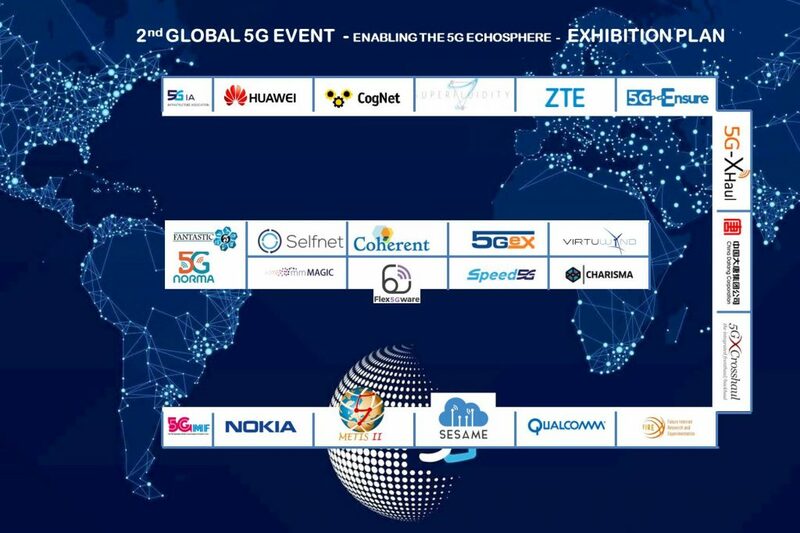 It was organised by the European 5G-Infrastructure-Association in co-operation with IMT-2020 (5G) Promotion Group, the 5G Forum, the 5G Mobile Communications Promotion Forum, and 5G Americas. During this two-day event, government representatives from Brazil,China, Italy, Japan, the United States, South Korea and Sweden, high representatives from the European Commission, association leaders, more than 250 industry experts as well as more than 30 universities and research centers participated and shared the latest Research and Development achievements. ➧ Presentations and photos are available on the event page here. 5G-Crosshaul showcased 5 demonstrations validating the concept of integrated fronthaul and backhaul. These included a next generation fronthaul interface from partner CND carried along with backhaul traffic over millimeter wave transport from InterDigital. This same fronthaul traffic was also demonstrated over LED-based optical wireless from Fraunhofer HHI. A silicon photonic ROADM switching device from Ericsson was also shown for enabling cost-effective multiplexing of time sensitive fronthaul and backhaul. 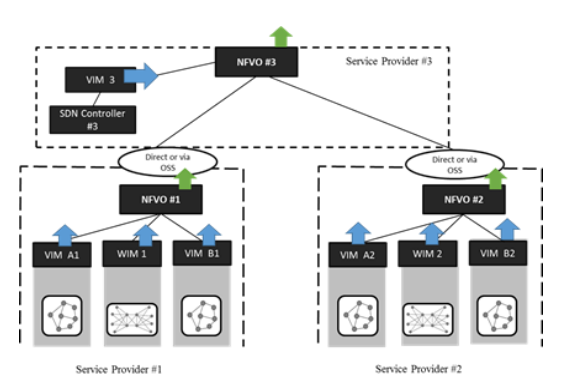 Network applications were also demonstrated over 5G-Crosshaul management and orchestration system such as energy monitoring and management from Nextworks and SDN-based broadcasting from Visiona. The concept of tunable WDM-PON solution to the optical back- and fronthaul by ADVA Optical Networking. The demo highlighted the tunable ONU/tail-end transceivers with a single centralized wavelength locker and a video footage showcased the autonomous wavelength tuning of the ONU/tail-end, and the prototyped ONU devices. A Gigabit Wireless Software Defined Mesh Network by BWT. BWT demonstrated a high speed wireless mesh network constructed from BluWireless Technology’s 60GHz modem coupled with i2CAT’s wireless extended OpenFlow client and controller. Traffic is automatically routed through the mesh network taking alternative paths where a link is broken or interrupted. BluWireless’ LightningII modules provide a >1Gbit over the air wireless channel allowing streaming of high bandwidth data through the mesh. i2CAT’s wireless extensions to OpenFlow enrich the data available to the Software Defined Network controller making traffic routing and network configuration decisions. This technology is considered as a fundamental enabler to support the massive deployment of outdoor Small Cells in future 5G networks. Key concepts behind the hierarchical SDN control plane of the 5G-XHaul transport network were also showcased by the University of Thessaly. Since the transport network is divided into areas utilizing different wireless or optical technologies, we focus on the functionality provided by our control plane in a specific area that leverages on WiFi. The demo showcases how VNFs that are hosted in special nodes (ETNs) connected to the edges of the area can be connected through a virtual topology defined by a tenant. The network is able to find the best path connecting each pair of ETNs, as well as to change this path at the physical topology seamlessly without losing their connectivity. The SDN agents controlling the ETNs are semi-autonomous, in the sense that they are able to take some actions immediately, while for rare events there are communication channels with the area controller. A dashboard is also used, which is installed in the NITOS testbed and connected with the hierarchical SDN controller of the demo’s WiFi area. The dashboard illustrates the area, the VNFs, the transport nodes (TNs) and the edge transport nodes (ETNs) included in this area, as well as the virtual and physical paths connecting the VNFs. 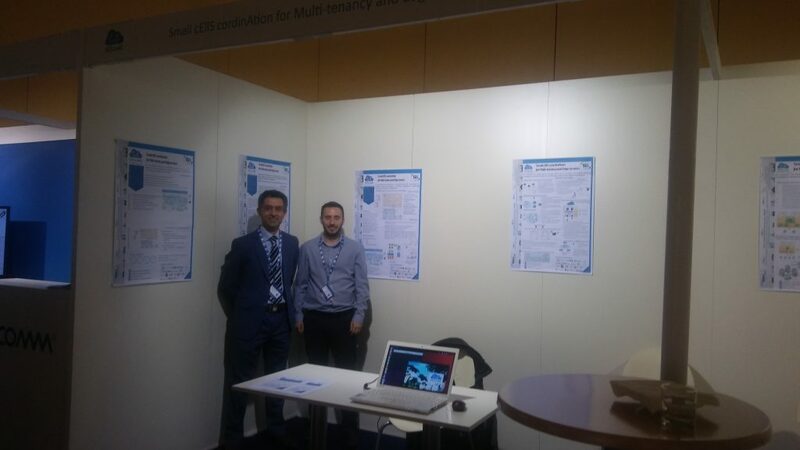 5G-ENSURE showcased its “Privacy Enhanced Identity Protection” solution at the Global 5G Event in Rome. It has been developed as part of a first set of security and privacy enablers, available since September 2016. This privacy enabler targets one of the most important privacy issues affecting the unprotected transmission of subscriber permanent identifier, i.e. IMSI, enabling unlawful interception and user location tracking. This issue is also a hot topic in discussions taking place within 3GPP Security Group (SA3) and was also presented at Black Hat Europe, gaining considerable press coverage. 5G security standardisation is a priority action in 5G-ENSURE, which has already contributed to pre-standardisation in the 3GPP, ETSI and the 5G PPP Pre-Standardisation Work Group. The CHARISMA 5G concept is very nicely aligned with the 5G Global consensus from around the world (inc. Japan, S Korea, China, USA etc.) when considering to include aspects such as: mobile edge computing (MEC), low latency, and the transportation vertical sector. 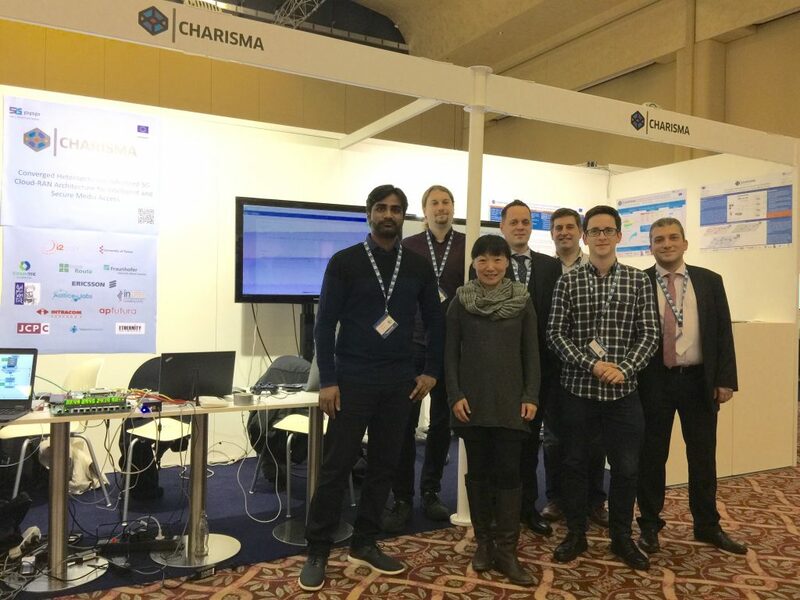 At the Global 5G Event in Rome, CHARISMA exhibited 3 main demonstrations: i) ultra-low latency capability (with a fun demo applying the issue of low-latency to driverless cars), ii) distributed security features (inc. virtualised firewall) and iii) open access (multi-tenancy). 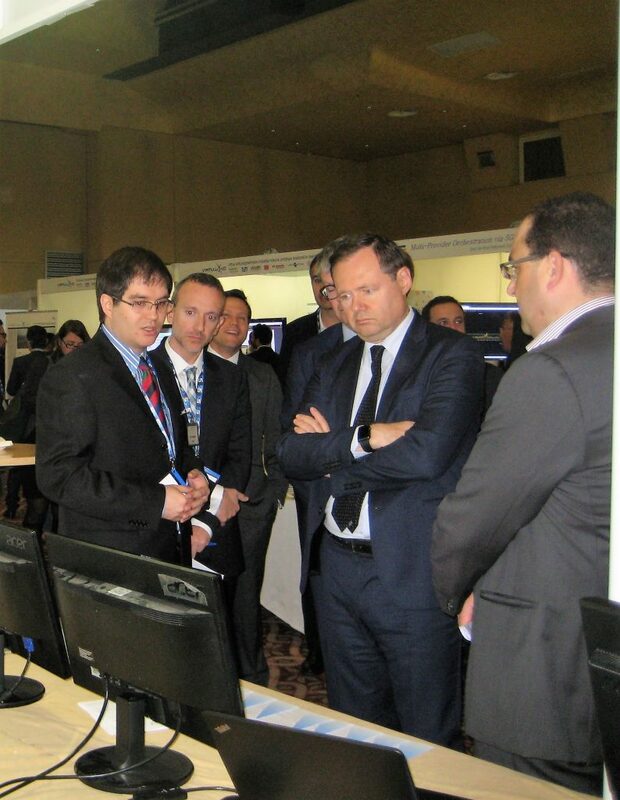 These demos attracted a lot of attention from other delegates and 5G PPP project participants. The 5G Global Event provided an excellent opportunity to understand the motivations, current status and objectives of the other 5G PPP projects, and a forum for dialogue and interaction with projects featuring common interests. In particular, the relative positioning, overlapping and context of CHARISMA with respect to the other 5G PPP projects. The presentations in the 5G Event conference forum were also extremely useful to get a heads-up on the current (and future directions) thinking across the world for 5G technologies roll-out, and provided additional incentives & inspirations to continue striving ahead for CHARISMA’s ambitious goals. CogNet ran two demoes, one was called the Noisy Neighbour demo, which showed how we could use machine learning and data analytics to determine which computing node that we should locate a Virtual Network Function on, given the nature of the current utilisation and finding a match between nodes that optimises the computing demand against the realtime QoS requirements of the VNF. The other was a real time traffic analysis demo that also showed how data analytics and ML is used to optimise the distribution of traffic across the network. A number of very interested visitors were hosted, including the CEO of Telefonica I&D who was very interested in the project and its relevance to specific areas of research being pursued by Telefonica. In Flex5Gware, 11 different PoCs will be all showcased in a final demo event by June 2017. However, preliminary prototypes and results of these 11 PoCs were already made available by November 2016 at the 2nd Global 5G event in Rome. In particular, the following was shown: improvements in terms of reduced cost and footprint for the analogue hardware, mixed signal architectures for improved transmission rates and spectral efficiency, and, finally, increased flexibility and reduced energy techniques based on context aware resource allocation. 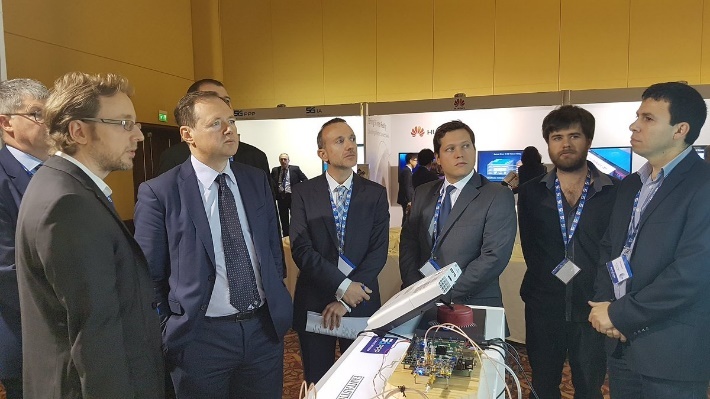 Fantastic-5G presented a demo in Rome. It showed the main Fantastic-5G concepts including innovative Post-OFDM waveforms, joint multicast/broadcast transmission realizations and system level demonstrations. Three promising candidate waveforms were demonstrated using real-time hardware platform: Flexible Configured (FC)-OFDM, Universal-Filtered (UF)-OFDM, and Filter Bank Multi-Carrier (FBMC). The demonstration illustrated the high benefits of post-OFDM waveforms in supporting high mobility and asynchronous transmission in the context of vehicular and massive machine communications. Regarding the joint multicast and broadcast transmissions demonstration, the main idea is to convey a broadcast stream to all users plus additional multicast/unicast streams to dedicated users or group of users. To achieve it, on the transmitter side the common and dedicated streams are multiplexed, while on the receiver side a GUI with different metrics and different streams were demonstrated. Finally, the demo demonstrated how the different technical components proposed by the project are seamlessly integrated into the system level simulator, fine-tuned and then evaluated. Scenarios with different numerologies and massive access mechanisms were demonstrated in order to showcase the effective delivery of massive machine communication (MMC) and mission critical communication (MCC) services. 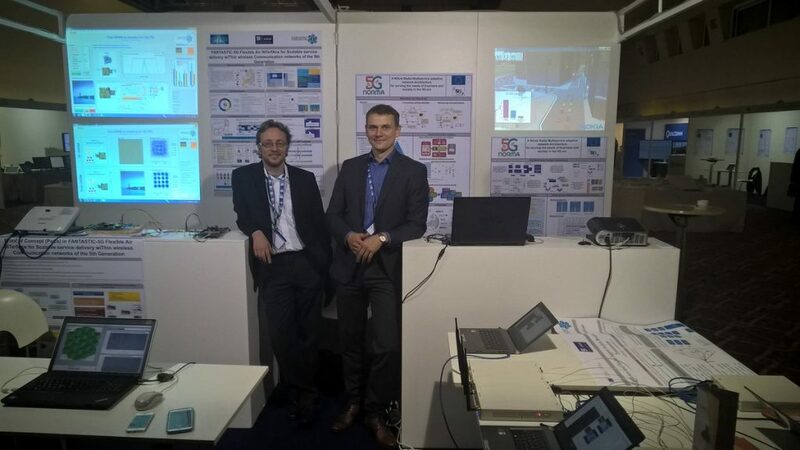 In the 5G Global Event in Rome METIS-II was present with a booth where the visualization platform was showcased both on dedicated laptops and on tablets. This tool is one of the main achievements of the project and is also functional to illustrate the innovations brought to the 5G RAN design, which is one of the main objectives of METIS-II. In Rome a new version of the tool was prepared, including the latest findings from the technical Work Packages. The booth was visited by many delegates, including Mr. Roberto Viola and the top management of TIM, sponsor of the 5G Global Event. 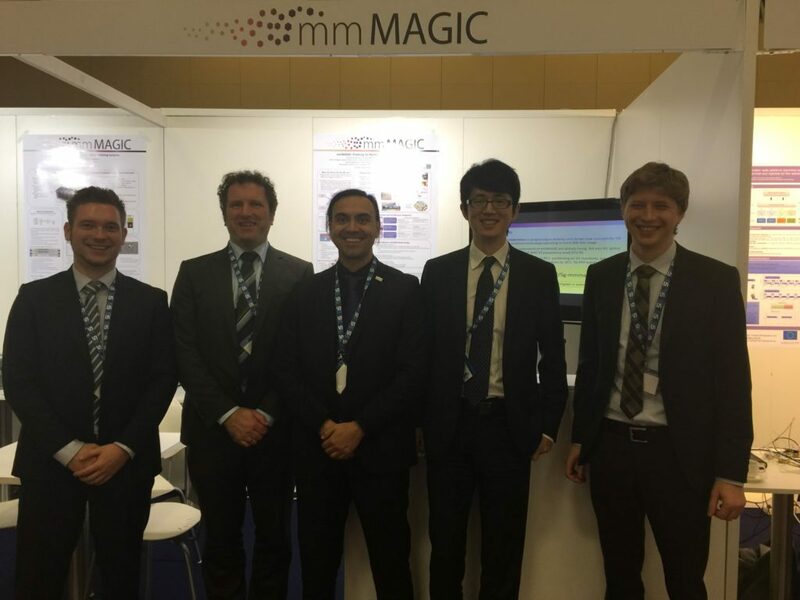 mmMAGIC showcased 5G mm-wave hardwave demos on PAPR reduction for OFDM-based waveforms and also beamforming. mmMAGIC had a great attendance to its booth from the visitors and experts from all corners of the globe, including Deputy Head of Cabinet of European Commissioner G. Oettinger, Thibaut Kleiner and CEO Telefocnia I+D, David del Val Latorre. In its booth SELFNET presented several demo videos of AUTOMATED PHYSICAL AND VIRTUAL INFRASTRUCTURE DEPLOYMENT, APPS MANAGEMENT, NETWORK TOPOLOGY VIEWER and the achievements in three use cases SELF-PROTECTION, SELF-OPTIMIZATION and SELF HEALING. 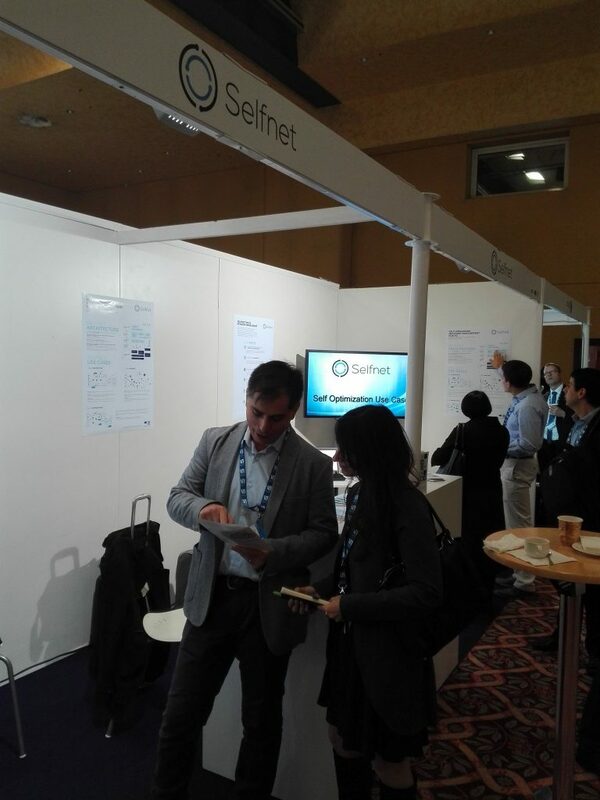 During the two days visitors had the opportunity to talk to our SELFNET experts about the SELFNET architecture, and its envisioned capabilities in managing future 5G networks in a highly autonomic and intelligent fashion. The demos have been very well received by the audience and lead to good talks with visitors and experts from all over the world. SESAME showcased 2 demos. The objective was to show: (i) SESAME architectural elements and features; (ii) End-to-end (E2E) connectivity in the SESAME system; (iii) Integration of the main SESAME components: that is, professional Evolved Packet Core (EPC), an ARM-based computing platform and a commercial LTE small cell; (iv) Virtualization using an ARM-based computing platform, and; (v) Performance of an accelerated virtual switching solution. The 1st SESAME demo consisted of two parts: (i) An LTE small cell has been connected to an EPC so as to provide LTE connectivity. An ARM-based computing platform, running Virtual Network Functions, has been connected between the Small Cell and the EPC for offering local IP access. The 2nd SESAME demo consisted of an ARM micro-server, based on the NXP platform, running two KVM virtual machines and an accelerated virtual switching solution has been demonstrated. SONATA contributes to both the flexible programmability of software networks and the optimization of their deployments, supporting network function chaining and orchestration. The term 5G goes well beyond new radio interfaces and spectrum allocation. The definition of 5G networks is aligned to what Software Networks are intended since they were originally conceived. The targets are to enable Heterogeneous services on a regular infrastructure and to support for dynamic, independent management of tenant virtual networks through the slice concept, with Optimal function placement. The goals of 5G require Software Networks as a key enabler and standardization groups such as ETSI NFV that are accelerating the uptake. Their focus should be in definition of “framework and interfaces” while other open source initiatives such as OSM, Open-O, etc focus on the implementation of solutions. The fact there are multiple alternatives does not mean fragmentation if we have common framework that ensure compatibility and portability of network services in these solutions. SONATA as a project had a short presentation of key ideas about software network evolution in the presentation from Diego Lopez (Telefonica I+D, extract below). 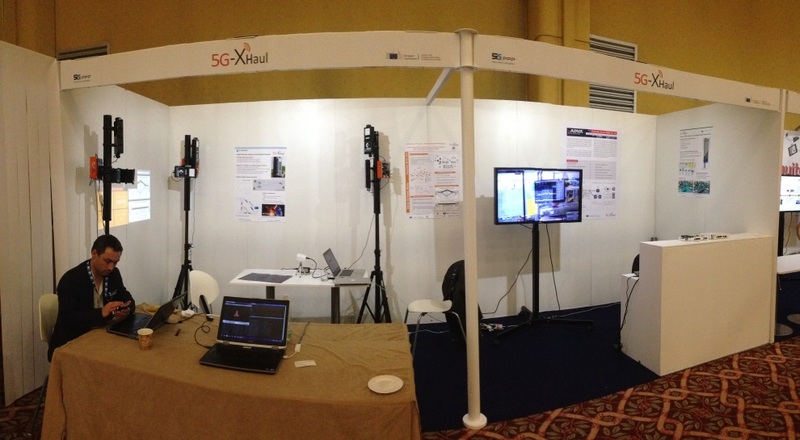 SPEED-5G participated in the 2nd Global 5G Event in Rome, Italy, on 9-10 November 2016. 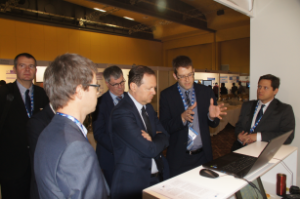 At the booth, SPEED-5G partner WINGS ICT Solutions demonstrated a key project result: quality of service (QoS) provision and capacity expansion through extended-DSA for 5G. The demonstration included SPEED-5G’s innovative solutions for extended-Dynamic Spectrum Allocation (eDSA) concepts through live system-level simulations. The eDSA concepts utilises several spectrum bands, cells and technologies, which are jointly managed in order to offer improved quality of experience (QoE) and a significant capacity increase in a cost-efficient manner. SUPERFLUIDITY will instantiate and provision network functions and services on-the-fly, run them anywhere in the network, move them transparently to different locations, and make them portable across multiple hardware platforms. As a result, the 5G network will benefit from: i) location-independence: network services deployable in heterogeneous networks; ii) time-independence: near instantaneous deployment and migration of services; iii) scale-independence: transparent service scalability; and iv) hardware-independence: development and deployment of highly performant services, irrespective of the underlying hardware. The end result is a cloud-native 5G concept that will enable innovative use cases at the mobile edge, empower new business models, and reduce investment and operational costs. SUPERFLUIDITY presented two demonstrations: 1) rapid deployment/reconfiguration of a software-defined wireless network (C-RAN), integrated with Mobile Edge Computing, for efficient video delivery from the edge; 2) Demand-driven orchestration for 5G deployments. The 5G PPP projects METIS-II, FANTASTIC-5G, mmMAGIC, 5G-CROSSHAUL and Flex5Gware all have the aim to take the 5G design one step further in level of detail, and prepare a smooth start of 5G standardization in 2017. ➧ Follow up and read more here. mmMAGIC is organising the 2nd International Workshop on Millimeter Wave-Based Integrated Mobile Communications for 5G Networks (mmW5G) on March 19, 2017 in San Francisco (USA). The workshop is co-located with IEEE WCNC 2017 (19-22 March 2017). And also be prepared for the Mobile World Congress 2017!